Description: Absolute Time Server is a full-featured time server, which works as WinNT service and is fully RFC-868 and RFC-2030 compatible. Absolute Time Server acts as a background process, has very low system resources consumption, and it can be started before user logon. Description: Advanced Time Synchronizer is a powerful and easy-to-use PC clock synchronizer. It works with time servers on the Internet. Advanced Time Synchronizer can update the system time at certain intervals from one second to few months, supports three time synchronization protocols, proxy servers, and auto-dialing. 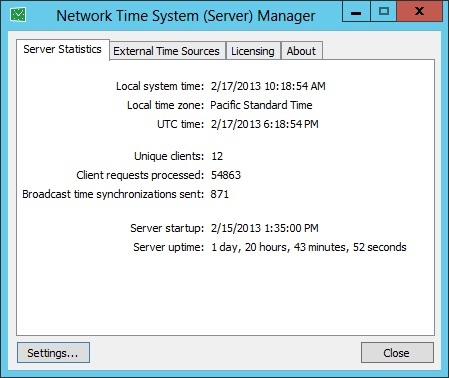 Advanced Time Synchronizer can also work as a local time server and can be launched as a Windows Service. Description: ACS - atomic clock synchronization utility. Very simple and very usable. At the same time, many adjustable properties does the program very convenient in use. Forget about clock problems. With ACS you always will be assured in their accuracy! - simplest process to synchronize clock; - possibility of full automatization of process; - flexible usage and adjusting; - multiple inquiries for more precision; - install and uninstall support. Description: Chronos Atomic Clock Synchronizer is a utility for people who need their computers to use exact time. The program connects to various atomic clock timeservers and synchronizes your internal clock with time provided by these servers. Key benefits: connects on many atomic clock time servers; you can add any time server needed; improved algorithm to calculate differences between servers; calculates delays and synchronize on less than 0.1 seconds. Description: PresenTense Time Client is a time client for Windows NT/2000/XP/2003/Vista. It synchronizes your PC system clock to a network time server or local GPS. Supports email and SysLog alarm, redundancy and and can be remotely managed by LanTime Analyser. Free Run as required by NINA. Keeps your computer clock accurate within microseconds! Central configuration via DHCP for all clients on a network. One-click cloning. Auto reconfiguring of Windows Time. Description: PresenTense Time Client is a network time client for Windows NT/2000/XP/2003/Vista. It synchronizes your PC system clock to a network time server or local GPS. Supports e-mail and SysLog alarm, redundancy and and can be remotely managed by LanTime Analyser. Free Run as required by NINA. Keeps your computer clock accurate within microseconds! New: Central configuration via DHCP for all clients on a network.